Let me give you a few situations. A PC uses his strength to push over a bookcase to obstruct a doorway – then attacks (or looks for an escape route) while the bad guys try to squeeze through. …What bonus do you give him for having a bookcase on his side? The PCs are spreading rumors around town to make their rabble-rousing speech even more effective later. …Do you tell them to roll streetwise or leadership, and what bonus do you add to the speech if they succeed? One PC opens up with his blunderbuss while his friend dashes across the room to the switch. A success for Blunderbuss Guy means the enemies have all ducked their heads …but what penalty do you give them and how long should it last? In each of these situations, the PCs are attempting to create a situational advantage – they’re using a strategic “prep” action to even up the odds for their next action. Fate Core has a brilliant way to make these situations as easy to resolve – but I dare say the concept can be adapted to any system. First I should explain that Fate uses a concept called Aspects to describe everything: PCs, NPCs, situations, even whole game worlds. (“Can’t Let An Insult Stand” might be an example of a character aspect, “Cramped Quarters” might be a situational aspect, and“The Empire Has Ears Everywhere” might be a game aspect.) An Aspect is a standing condition that can come into play at any time. If an aspect could conceivably be an advantage on one of your rolls, you can “invoke” it or bring it into play by spending a benny – which grants a +2 to that roll. When a PC rolls Physique skill to push over a bookcase and succeeds, he’s created the situational aspect “Blocked Doorway.” He can now invoke Blocked Doorway for free least once – depending on the level of his success – which would add a +2 to his next attack roll, escape roll, or any other roll that would reasonably be benefited. …probably even a bad guy’s attempt to kill you by burning the building down. When a PC successfully spreads a rumor, it means she’s created the situational aspect “Rumors Are Flying,” and it can be invoked, by anyone, for free at least once. When a PC uses Shooting to lay down covering fire, a success means he’s created the situational aspect “Duck!” His friend or anyone else can invoke it for free, at least once, depending on the level of success. The concept of aspects probably can’t be directly patched into other systems, but Fate’s concept of resolving “create-advantage” actions can be repurposed. Keep an eye out for when a player action is intended to create a situational advantage. You’ll have to watch for it and maybe ask to be sure, because unless you’re playing fate your players probably won’t state it this way. You can always have that bookcase crush a guy for aded drama, but when they succeed at creating an advantage, the only real game effect is to grant a moderate – according to whatever system you’re using – bonus on a subsequent roll that would reasonably be affected by whatever advantage the action created. If they succeeded by a narrow margin, tell them they’ve secured a one-time bonus. If they succeeded more strongly, you can say it created a standing bonus for all actions that might be reasonably affected. I think if it’s easy to picture, it should be easy to put into game terms. Thinking in terms of actions that create advantages vs actions that do other things helps you grant a simple bonus, let the players apply it to any roll that seems to fit, and move on with the scene. 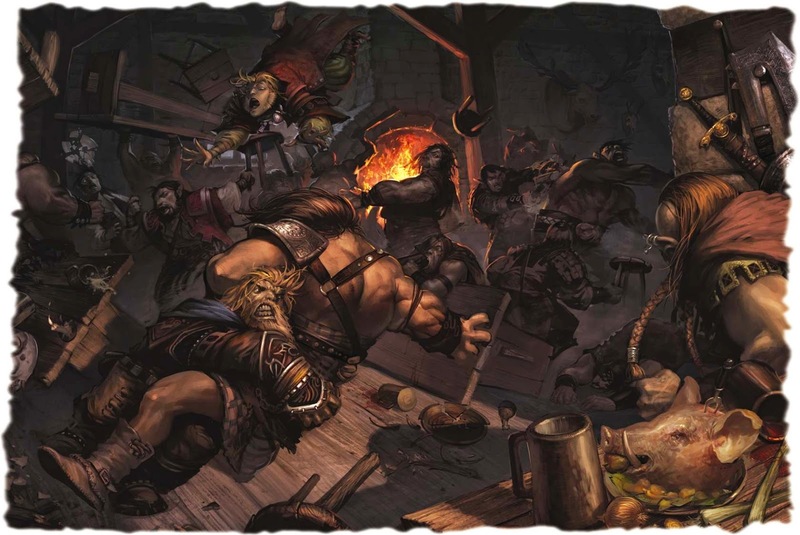 From Paizo Blog. If your preferred approach is the opposite of FATE’s, check out their excellent article on Manipulating Terrain.